via Encyclopedia of Anti-Revisionism On-Line. First published in Viewpoint Magazine. Saba writes that it would have been better if my book had been able to give more attention to some of the “less well-known, out of the way groups.” I agree. 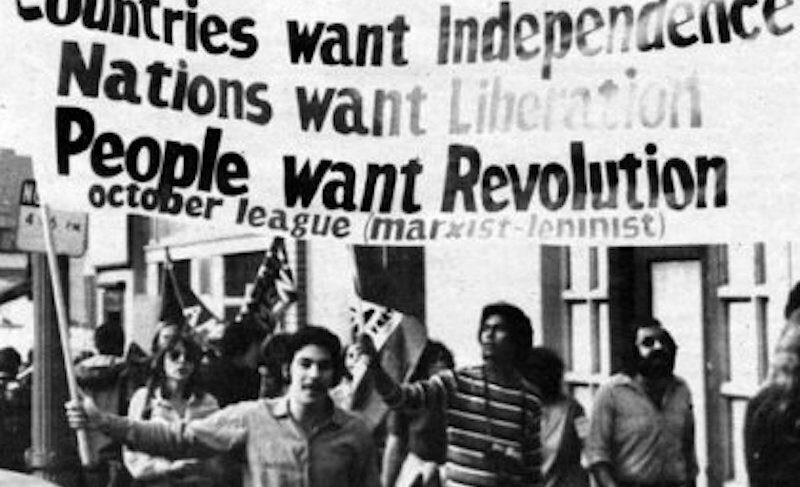 But more attention to the militantly anti-Stalinist Sojourner Truth Organization, or to the numerous collectives that were led by activists whose main ideological formation came via Cuba and the Venceremos Brigades, would only have reinforced the reasons to utilize the ideologically broader “Third World Marxism” framework. Likewise it is a “Third World Marxist” frame that better explains how an NCM group that Saba cites favorably in a previous article in Viewpoint would choose the name Amilcar Cabral/Paul Robeson Collective when neither Cabral nor Robeson were in any way “anti-revisionist”; and why the Guardian newspaper — more influential in the party-building movement’s early years than any other NCM formation — insisted that Cuba’s intervention in Africa was a shining example of proletarian internationalism when Maoist China and its US supporters were bashing Cuba as a “puppet of Soviet social-imperialism.” The interesting discussion of League of Revolutionary Struggle in Saba’s review also is evidence that, whatever the ideological pronouncements of a self-defined pro-China anti-revisionist organization, an underlying commitment to the liberation of peoples of color was a more powerful force in determining a group’s actual strategy and practice. The Chinese polemics described by Saba were part of this broader process. But their main impact was not merely to “demand a debate” on the orientation of the international communist movement. Rather, it was to argue that a particular assessment of communist history, theoretical framework, political strategy, and organizational approach provided the solution to this crisis, which they interpreted as an alleged betrayal of Marxist-Leninist principles by the CPSU. The CPC asserted that the policies and outlook of the CPSU had been revolutionary under Stalin, and framed the wide-ranging debate as a manichean conflict between Stalin’s genuine Marxism-Leninism and “revisionism.”; The CPC’s political strategy was merely reheated older Comintern positions, insisting that the advent of nuclear weapons didn’t change much — if anything — about how class and political struggle would unfold; the organizational perspective that flowed from this was to reaffirm a proposition entrenched in the Stalin period: that there could be one and only one genuine revolutionary party in each country, and so the task was to form such parties in all countries on an anti-revisionist basis. Bottom line, the polemics simply argued that one form of communist orthodoxy should be replaced by another. the Maoist leadership chose to present their critique of the Soviet line as one of defending orthodoxy in communist politics and theory against revisionism. This was a fatal mistake. As the French communist G. Madjarian correctly noted: “The fight against ’revisionism’ cannot be waged by conserving, or rather, by merely re-appropriating, Marxism as it existed historically in the previous period. Far from being the signal for a return to the supposed orthodoxy of the preceding epoch, the appearance of a ’revisionism’ is a symptom of the need for Marxism to criticize itself. Indeed, the entire history of Marxism was frequently recast in Chinese polemics as a “two-line” struggle between orthodoxy and its opponents. Since the Soviet line being criticized was said to have emerged after Stalin’s death, Maoism divided the history of the Soviet Union and the world communist movement into two distinct periods. First, the correct and revolutionary era that began with Lenin and came to an end with Stalin’s death and the triumph of Khrushchev, followed by a second period of revisionism and betrayal. It would incorrect to tell a declensionist story of anti-revisionist politics; it was not the case that their polemics were initially theoretically sound and on target, before later-day interpreters took them off-track. To be sure, the views and practices of the CPSU deserved forthright criticism (for instance, its conflation of Soviet state interests with the interests of the international working class, its shallow and self-serving evaluation of the Stalin era, its attempts to dictate policy to other parts, and much more). But the Chinese view was flawed from the outset, hobbled by its defense of orthodox formulas from the Stalin period under the rubric of “anti-revisionism.” The full negative consequences of this flaw took several years to make themselves felt, especially when the CPC declared that the USSR had restored capitalism and become the more dangerous of the “two superpowers.” But the problem was there from the beginning. On a more general level (and a point well worth stressing today) freeing ourselves from the anti-revisionist straitjacket of “one exclusive vanguard/only one genuine Marxist tradition” makes it far more possible to build organizations that are appropriate for changed conditions and able to explore new theoretical ground. It allows for healthier modes of debate and cooperation with others on the left — and within one’s own movement — than the NCM practiced. Strivings for a “franchise” from one or another prestigious party, or for a theoretical holy grail that gives one the keys to the kingdom of truth, can be dispensed with in favor of a focus on politics and strategy under the “conditions directly encountered.” Groups can struggle over differences with a sense of proportion; no longer are the stakes determining which one (and only one) is truly revolutionary. Likewise, the potential for left forces who have different ideological histories converging via a process of practical cooperation and comradely debate becomes a desirable scenario rather than a heresy. Precisely that happened in El Salvador, where five different revolutionary groups converged to form the FMLN including the “traditional’ Communist Party, which dramatically shifted its views concerning strategy and the role of armed struggle in the process. I’m all for defense of Marxism and a revolutionary outlook: the last section of Revolution in the Air is sub-headed "Re-legitimizing Revolutionary Politics." 5 But I see the best road to accomplish that in a different way. For reasons already stated I think pinning the argument for Marxism on defense of “anti-revisionism” will lead to a dead end. And it seems to me that arguing we will make headway by putting priority on defending Marxism from “hostile currents” is simply a different way of phrasing this same backward-looking approach. The road to expanding Marxism’s influence is by understanding its past weaknesses in order to renew and enrich it. Part of this is winning the battle of ideas — offering analyses of both current events and underlying trends that illuminate what is taking place more sharply and accurately than assessments coming from other quarters. But even more than that, Marxism’s influence will grow when organizations and movements informed by Marxism gain large-scale influence in the working class and communities of color and begin to affect the direction of the country. Today’s left is indeed ideologically eclectic. That has been true of virtually every new surge of radicalism, in any country, over the last hundred years. That reality will not change mainly by arguing that there is a valuable Marxist tradition to be defended, but by drawing on that tradition — as well as on the most advanced ideas in bourgeois thought, as Marx did in his time — and producing analyses and strategies that reach people intellectually and move them politically. Moreover, it is vital to establish a different relationship between Marxists and partisans of other radical and revolutionary frameworks than the NCM or any orthodox Communist Party of the pre-1989 period advocated. Theoretical debate of course; but for rebuilding a relevant U.S. left the more pressing challenge is to struggle for as much common ground as possible on the level of political program and strategy. Utilizing a rigorous Marxist framework to analyze the world is an excellent place to start. But there is no framework, no formula, no method, that directly yields — much less guarantees — an accurate assessment of objective conditions, the balance of class and social forces or what the next phase of battle will look like. Without that kind of assessment, one cannot succeed in politics, that is, in changing the world. That’s why Lenin wrote that “concrete analysis of concrete conditions” was the “living soul” of Marxism. Today’s resurgent left can ill-afford to repeat the mistakes of the NCM in this regard. We are all encouraged by the surge of radical activism in this country since Occupy, #BlackLivesMatter, Bernie Sanders’ campaign, and the election of Donald Trump. The explosion of expressed support for socialism by young people is a source of great hope. But what is the actual level of influence of the left in a situation where, as Saba accurately notes, “the international balance of forces still favors the right”? 1. Max Elbaum, Revolution in the Air: Sixties Radicals Turn to Lenin, Mao and Che (London: Verso, 2018), 3.